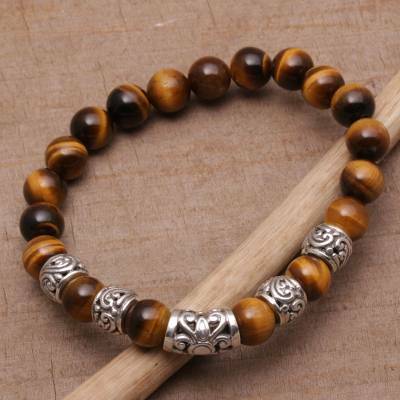 A bold and striking accessory for men or women, this stretch bracelet is beaded with natural round tiger's eye stones that are punctuated by sterling silver vine motifs. Balinese artisan Asmara Putra designs the bracelet. All components of this bracelet seem to be of excel;lent quality and designed beautifully. The only reason I didn't give it 5 stars is it runs a little on the small size. This causes the stones to separate slightly. Still, I would purchase again and have recommended it to many friends. Unfortunately I received this bracelet in the plastic bag but the beads were loose - all not attached to the plastic line - I had to try and put it together / very disappointed! !